Pizza is an essential standby meal in our home. One of the nice things about homemade pizza, is that it can be a canvas for whatever toppings are preferred. It is a versatile dish. Another great thing about pizza is that it can be assembled with the help of little ones. My boys love helping in the kitchen. The oldest, in particular, is very proud of his cooking efforts. Though, it has not proved an effective solution for the toddler finicky eating habits. This recipe makes two pies at a time. I usually prepare both and then freeze one for later. 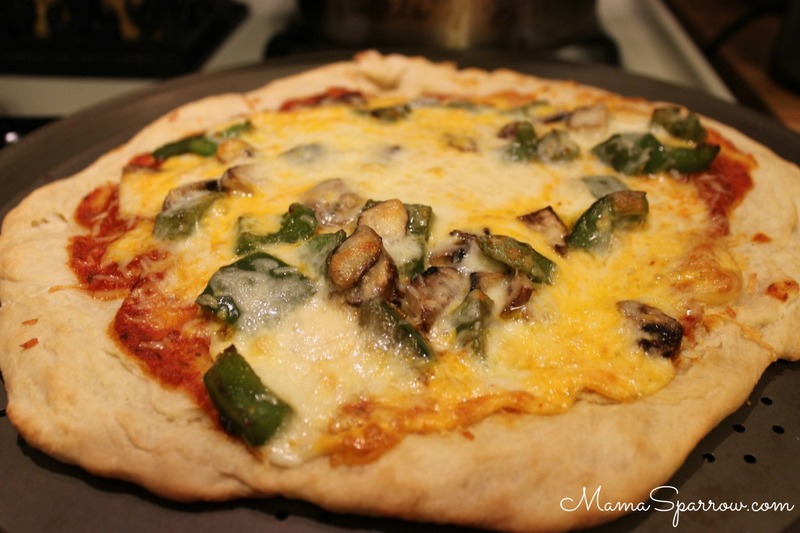 A homemade freezer pizza is such a treat on busy nights. Mix together the dry ingredients in a large mixing bowl with a wooden spoon. Stir in the oil and water. Once it forms a soft ball of dough, knead the dough in the bowl. It should become smooth and formed after about 2 minutes of kneading. Let the dough rest for a half hour. After the resting period, divide the dough into two balls. Each ball of dough will fit a 9-12 inch round pie pan. Roll the dough out into rounds and bunch the outer edges into crust edges. Melt the butter in a small bowl. Stir in the garlic salt. Brush the crusts with the melted butter mixture. Before the adding the toppings, prebake the crusts. Preheat the oven to 425F. Bake the crusts for about 8 minutes, just until dry on the surface. Top with your toppings of choice. I usually saute my vegetables in a skillet with olive oil until they are just about tender. Eating Now: If eating immediately, bake at 425F for 10 - 15 minutes until cheese is melted and crust is golden. Freezing for Later: If freezing for later, set pizza on a cooling rack to allow crust to cool completely. Prepare the pizza for freezing by wrapping in plastic wrap and then a layer of aluminum foil. Mark the wrapped pizza before placing it in the freezer. To prepare frozen pizza: Preheat oven to 450F. Place frozen pizza on baking sheet or reuse the aluminum foil it is wrapped in. Bake the pie for 15 - 25 minutes, until the crust browns and the cheese is bubbly.